Yesterday, I posted a code sample of the simplest web server I could create using node.js. After reading my post, Tugberk Ugurlut pointed me to http-server and his blog post on http-server. The “-g” switch installs this library locally. I tried it without that switch, but it did not work. However, the advantage of installing it globally is that it will work in any new folder you create on your computer. Notice that you don’t need to type the “.html” or “.htm” extension. The server is smart enough to know the page you are looking for. 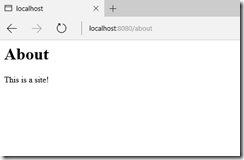 This is a very simple way to quickly install, configure, and start a lightweight web server on your local PC for testing or creating static pages. I found a lightweight web server solution in node.js, which is quick to install, quick to start up, and (relatively) simple to use. As a bonus, it will run on multiple operating systems. Here are the steps I use to create a web server. You can download node from https://nodejs.org/en/download/. Select your operating system and run the installer. It is a small download and a quick install. 2. Create and open a folder for your pages. save it as a dependency in the package.json file. See the session below for reference. As you can see the file you create is echoed to the screen before you confirm its creation. Express and ejs are packages required for a simple web server. You can use the npm install command to install them. Add the "--save" switch to this command to update the dependencies in your package.json file. The following 2 commands install express and ejs packages, respectively. 6. Create a main script. Below is the simplest script I could create that serves up any page in the "views" folder and sets a default page. In the example above, I named it "index.js". You can name it whatever you want, but you should set the "main" attribute in package.json to the name of your file. I have commented each line to explain what it does. We think therefore we are! To start your web server, simply type "node" followed by the name of your main script. This will launch node and tell you the server is running on port 3000. At the command prompt, press CTRL+C at any time to stop the server, making these pages unavailable. You can view this sample code at https://github.com/DavidGiard/simplenodewebserver. Microsoft Cognitive Services is a set of APIs based on Machine Learning and exposed as REST web services. The Emotion API analyzes pictures of faces and determines the emotion shown in each face. Today I am grateful for a chance to be part of the Chicago Code Camp keynote yesterday. -My first experience at a FIRST Robotics competition. -An upgraded flight home last night. Today I am grateful for an upgraded hotel room and my first taste of Peruvian food. -for dinner last night with Nick, Kathy, and Rick. -that I arrived safely in St. Louis, despite a rocky start to my trip. -to Nick for driving me to and from the airport last night. Today I am grateful for a hot sauna at the end of a long day. Today I am grateful for breakfast on my balcony in my pajamas. Today I am grateful to spend time with Nick and Adriana in Chicago this weekend. Today I am grateful for the variety of people I meet every day. Today I am grateful for this view. Today I am grateful to attend the AWS Summit yesterday with Brian and Kevin. Today I am grateful that I got my car back with a repaired fender. Today I am grateful to sit out on my balcony last night sipping a cocktail and enjoying a warm breeze. Today I am grateful for a drink and some beer cheese soup last night with Katie, Justin, and Shira. -Dinner at a Columbian steakhouse in Lakeview. Today I am grateful to see Johnny Clegg in concert last night, after 30+ years as a fan. Today I am grateful for lunch with Nonnie yesterday. Today I am grateful to get together with my team yesterday, which doesn't happen often enough. Today I am grateful that all these family photos are now hanging on the walls of my new apartment. Today I am grateful that my taxes are filed. -The opportunity to deliver the keynote presentation at the Tech In 2016 conference yesterday. -A front-row ticket to see Marshall Crenshaw last night. Today I am grateful I was able to track down all my missing tax forms yesterday. Today I am grateful for my new cuff links - the first I've received in years! Today I am grateful for the power of ibuprofen. Today I am grateful for dinner last night with Shelly and her family. Today I am grateful to Brian for helping me prepare my upcoming presentation on Virtualization Containers. Today I am grateful that I've been able to make it to the gym almost every day for the past 3 months. Microsoft Cognitive Services uses Machine Learning to recognize text within pictures and exposes this functionality via a RESTful Web Service. 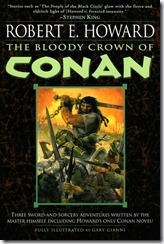 The Bloody Crown of Conan is the second volume in Del Rey's 3-volume set of the complete Conan stories by Robert Howard. While volume 1: The Coming of Conan the Cimmerian included mostly short stories, this book contains 3 longer works: The People of the Black Circle; The Hour of the Dragon; A Witch Shall Be Born. The Hour of the Dragon is a full novel that takes Conan across many countries of the Hyborian world. It is set in a time when Conan has risen to be king of Aquilonia. Conan's enemies resurrect a dead spirit to enchant the king and steal his throne. Conan's quest to regain the crown leads him across much of the known world, where he fights numerous bottles and raises an army to retake Aquilonia. The action and the epic sweep of this story make it one of Howard's best and enhances this collection. The other 2 novellas, while not as long or involved as The Hour of the Dragon are more complex than most of Howard's short stories. By this point in his career, Howard seems to have hit his stride. The action flows freely, if violently, and we can enjoy the adventures of Conan who uses his nearly superhuman strength and skills to overcome nearly impossible odds. The collection ends with a few uninteresting first drafts of Howard's unpublished Conan stories, followed by a fascinating essay analyzing the themes of the Conan series and the evolution of the character. For escapism and adventure, it is difficult to beat these stories. 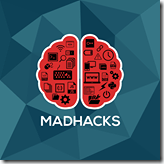 MadHacks is an annual weekend hackathon hosted at the University of Wisconsin in Madison, WI. The organizers decided to move the hackathon from the spring to the fall, which left a gap of nearly 18 months between events. 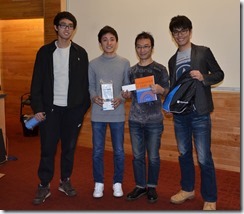 To maintain interest, they decided to host a smaller, 1-day hackathon on April 16. The event was billed as MadHacks Spring Fever. 85 students formed teams and submitted 18 projects. 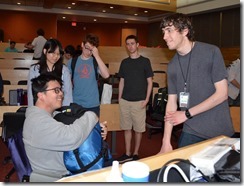 I served as a mentor and a judge at this hackathon. I also delivered a 1-hour presentation on Microsoft Cognitive Services. 4 judges evaluated all the submitted projects and chose the top 3. The quality of the projects made this difficult and we had to ask several of the teams to show their project again in order to make a selection. 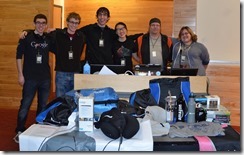 Many of the projects were Microsoft branded, such as Xbox games, Azure books, and Microsoft sleeping bags. UniTravel: A mobile application that mapped a route to a destination and calculated not only the time and distance, but also the estimated cost using various transportation options. Chemical Reactor: A web app that visualized atomic motion and formed new molecules if atoms collided with a force that exceeded the enthalpy required to bond. Cellular Automata Plant: A web app that visualizes the growth of plant cells over time in a given environment. 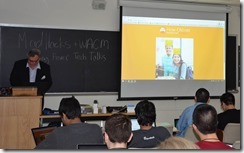 The event was organized by University of Wisconsin Microsoft Student Partner Katie Anderson. The projects created were particularly impressive, given that they were all created in 12 hours or less. A much larger hackathon is planned at UW-Madison in the fall semester.